The talented Zylofon Media artiste who arrived in Sogakope on Friday afternoon was mobbed by his teaming fans in an awesome welcome. 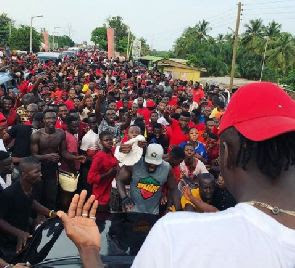 A video capturing Stonebwoy’s arrival at Sokakope shows a total roadblock to the extent that the Bhim Nation President has to negotiate with fans in order for them to make way for him and his crew. Stonebwoy is to perform in a mega concert dubbed. #ZylofonCashActivationConcert, the first of series of the regional launch of Zylofon Cash. Zylofon Cash is a system designed by Zylofon Media to help talented individuals to cash on their talents and creativity via the internet. Individuals who are registered on Zylofon Cash platform would have their videos uploaded on a YouTube channel and be paid royalties according to the number of views. The #ZylofonCashActivationConcert which will be held at the Victoria Park in Aflao will also see Volta award winning artistes Agbeshie, Keeny Ice, Kasare, Chief One Gh, Nuh Prince and a host of others perform on Easter Sunday. Ghanaian Dancehall heavyweights Stonebwoy, Shatta Wale who have been in the for the news wrong reasons and work under the same record label Zylofon Media would on Easter Sunday shut down the Volta Regional town of Aflao with a mega concert. Stonebwoy is the stage name of Livingstone Etse Satekla, a Ghanaian afropop, dancehall and reggae artiste. He is the CEO of Burniton Music Group. READ ALSO: Owner of Zylofon Media Prepares a Brand New Rolls Royce Car For Shatta Wale!